The conduction of heat in materials at extreme conditions is important in many processes, including the dynamics of deep planetary interiors, fast chemical reactions and explosions. Diamond anvil cells (DACs) are used routinely to produce extreme pressures in materials, and with pulsed laser heating, extreme temperatures are also accessible. Under these conditions, however, it is difficult to measure how materials conduct heat. To better understand the thermal conductivity of materials at very high pressures, Carnegie CDAC-affiliated scientists Alexander Goncharov, Allen Dalton, Viktor Struzhkin, and J. G. O. Ojwang, along with former Carngie Summer Scholar Michael Wong (University of California - Berkeley) and colleagues from Uppsala Unviersity placed a thin film of iridium metal in a DAC and surrounded it with argon gas. The pressure was increased to 50 GPa, where the Ar gas became a solid layer around the iridium foil. Brief laser pulses were then used to heat the sample to 2,500K. 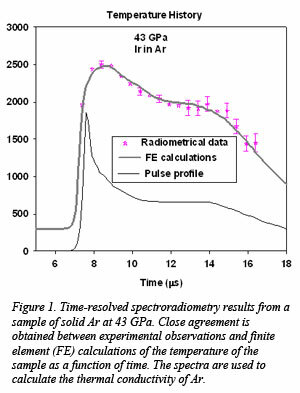 The microsecond laser pulses produced a temporal thermal profile across the solid argon sample (Figure 1). By measuring the temperature history of the iridium foil, it is possible to calculate the thermal conductivity of the surrounding argon medium. The thermal conductivity of argon at high pressure can be explained using a straightforward model based on kinetic theory, as illustrated by the close fit of the data points with finite element calculations. These results and new methodology are crucial for ongoing studies of how minerals behave in the Earth’s mantle and core. The results are also important to the broader high pressure research community because argon is used as a pressure transmitting medium in many DAC experiments. A more complete understanding of the behavior of argon at high pressures therefore will result in more accurate measurements of the properties of materials in extreme environments. [Goncharov et al., J. Appl. Phys 111, 112609 (2012)].